Handling images doesn’t necessarily need to be a burdensome task and users might be looking for solutions that would save them from resorting to sophisticated graphics suites. 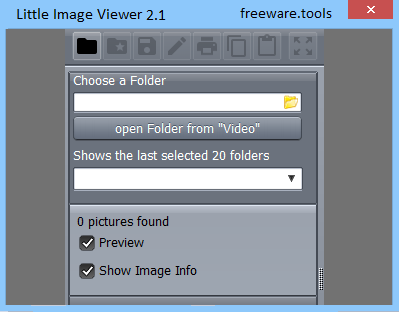 Such as software solution is Little Image Viewer, which was created to offer people an accessible image viewer utility. It will allow them to manage images in their directories, preview them individuality or even extract album art from audio files. In other words and simply stated, you can visualize images, flip, rotate or manage them in their directories, with this straightforward utility that can extract audio file album art. This tool is suited to professionals and novices alike. The application provides users with an attractive interface that carries a well-designed layout and several dark themes throughout its menus. One will be able to input the preferred image files easily, but unfortunately, when using drag-and-drop techniques, the utility will copy the files when dragging them over its interface. However, when going past this minor shortcoming, people might appreciate its easy image navigation, on-screen controls for rotating, flipping or resizing the loaded images. Featuring multiple tabs for its different tools, Little Image Viewer allows users to view single images, manage them in their directory, extract images from audio files, preview videos or import photographs directly from a digital camera. Little Image Viewer will allow one to select multiple images and save them to a slideshow, AVI, or PDF files. Multiple output formats for the AVI video characteristics are available and the PDF exporting allows one to input details such as author, title, etc. Because of its intuitive handling and easy-to-use features, Little Image Viewer could be a good starting point for novice users who are barely entering the field of image handling and editing. This utility addresses those who seek an easy-to-use image viewer that can allow them to visualize the preferred photographs, export them to multiple formats or set up slideshows. It will offer an accessible package with tools for basic image handling and management. Despite its ease-of-use and straightforward handling, Little Image Viewer might not be sufficient for the requirements of demanding users.